I've been getting a lot of complaints these days from friends and family alike. It's just because I'm not posting any veggie recipes during this season of Lent. They said they are loosing their control seeing the Fried Chicken Kabab!So I posted a Lemon Yogurt Cake and the complaints increased because a lot of them have given up sugar for lent! :-) Some of them did try the Garam Masala Pulao but for some , they needed something more than just a pulao! 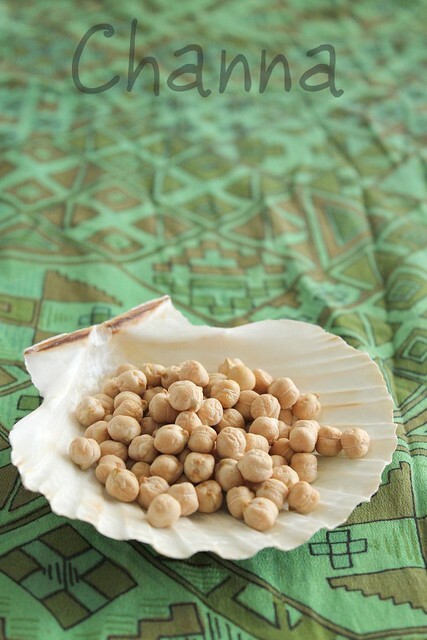 I love Channa, in any form. Some of my favourites are Sundal, Channa Masala, Papdi chaat or even just plain salted boiled channa. The black channa is also dearly loved in the form of a Kannur curry called Kootucurry. I use Kabuli Channa/ White channa/ Chickpeas more than the black ones. Jobin loves a good Chana Masala with Batura,so do I. Luckily the weather is super good in Minneapolis now and I can make Baturas to our hearts content without thinking of the fact that the oil smell is going to hang around in our condo for the next two days...just leave the balcony door wide open! 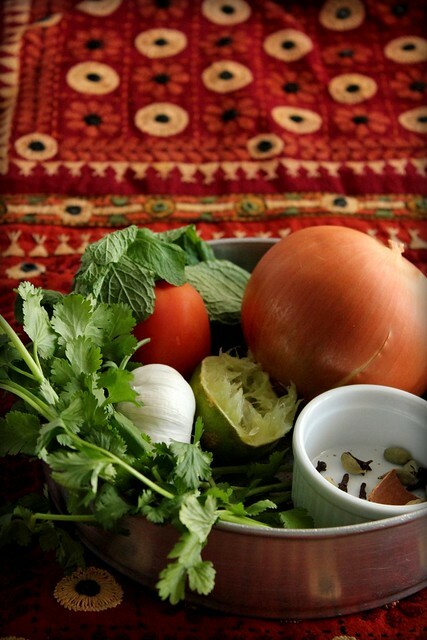 It's been a while since I've been thinking about a pulao/biriyani with this wonderful source of protein. I've seen quite a few recipes in cookbooks and on foodblogs but nothing tempted me as I wanted a greenish tinge to my rice. So last night, I went ahead and soaked some channa so that things would be easier the next day. This recipe might look like it's lengthy but trust me, it isn't. You can easily pull it off in less than 45 mins, if you plan as I planned :-) As much as I love to cook, I hate spending a lot of time in the kitchen, especially near the stove! Method: While you pressure cook the soaked chickpeas with some salt for 3-4 whistles, soak the rice for 30 mins. Meanwhile, get the other ingredients ready.Grind the coconut, ginger garlic paste and green chilies together, to a rough paste without adding any water. In a non-stick pot, heat oil and ghee together. Add the whole spices and stir for 30 secs. Add the onions and cook till they are golden brown.Add the tomatoes and cook till mushy, about 1 minute. Add the powders and saute for 30 secs. Add the ground paste and saute for a minute. Add salt & herbs. Mix well. Add the boiled channa and let it cook in the masala for a minute. Add the soaked and drained rice and fry for a minute. Add 4 cups of water to it, check for salt and finally pour the lime juice and stir to mix, carefully so that the rice grains don't break. Cover and cook on medium heat till the rice is done! Whenever I experiment, I wait for the smell of the dish to fill the house. I think everyone can judge how good or how bad a particular dish is going to be depending on it's smell :-) This time, I was in a biriyani haven and I knew I had nailed it! Serve it with a bowl of chilled Raita and maybe some papad too. How innovative! I love finding more ways to use up lentils :) Love that embroidered table cloth too. How pretty! 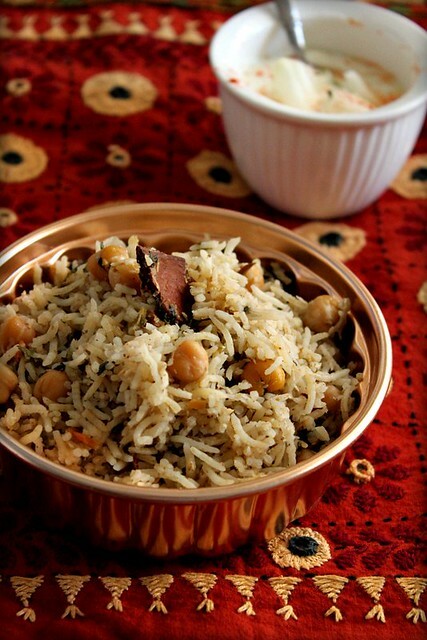 I make a similar pulao using greens only,makes for a filling meal with some boondi raita and papad on the side.Adding channa is a great idea,I've also heard people make channa masala and then proceed with the rice to make a channa masala pulao,great no? Very beautiful and apt for Lent! 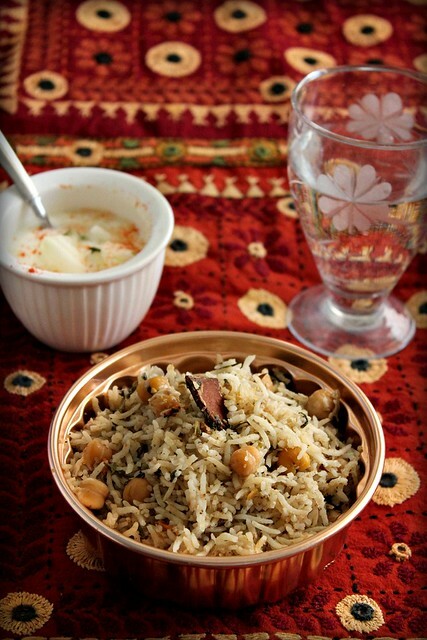 Channa Pulao looks so tempting! I also love the placemat/ table cloth. I have soaked kabuli channa this morning...no guesses on what's going to be made tonight! :) Please share the black chana curry when u get some time. I mostly make channa north indian style so a variation would be nice. I don't have pudina at hand but have some pudina chutney made with common ingredients which are also listed in ur recipe so I am going to add that while cooking. If you know how to use Kerala Tamarind and Kebab Chini please let me know. I am still waiting for ur reply. Priti, I must have missed out your question before. If possible take a pic of the tamarind and send it because it's not easy to judge and say without having a look at it especially since it's called as Kerala Tamarind. We use 3 different types in Kerala. I have never used Kabab Chini before but I am sure searching online will help you! Thanks for ur reply, Ria! I remember seeing a black chana curry at a friend's place many years ago it was served with this white 'log' made of something. I was asked if I'd like to taste some but I was too shy say yes and I regret it even today. I would be very grateful if you could share the recipe. You are THE BEST!!! I didnt even know what its called. 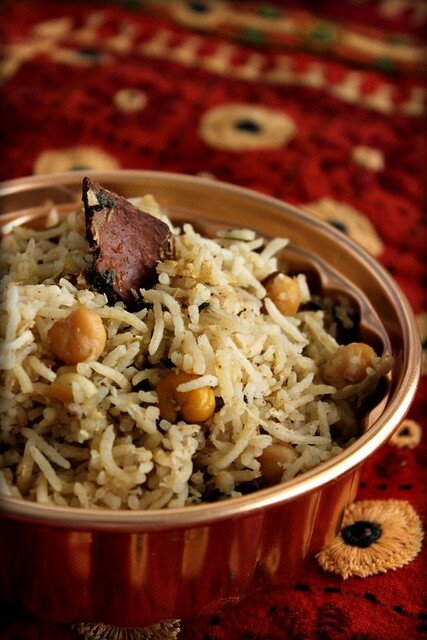 Chana Biriyani looks too good Ria. 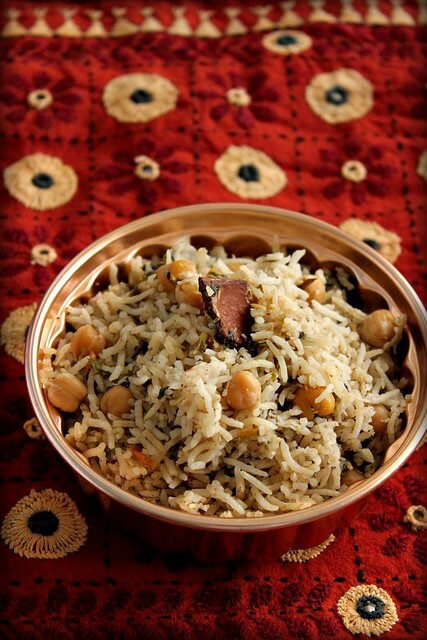 I remember making a pressure cooked chana biriyani long time back when I was expecting my first baby.That was when I could not stand the smell of any non veg dishes. :) Loads of proteins. I too love to add lot of coriander and mint to biriyanis. They give a very nice flavour.Will surely try your version and let you know. Hmm very innovative,Never heard abt it!! Will try soon!! Please note that all rights for the photographs and texts on this blog, unless otherwise mentioned, rests with the author.Please do not use without permission. Get FREE updates via Email! Food Blog by Ria's Collection is licensed under a Creative Commons Attribution-Noncommercial-No Derivative Works 2.5 India License. FRIED CHICKEN KABABS... Empire restaurant style!